I just can’t believe summer really came and went this year. It seems like just yesterday , I was decorating the blog for spring, I spaced decorating for summer, and now here we are back at Septembers theme. I haven’t posted here nearly as much as I would have liked this summer. I had a lot of projects though, and this was unfortunately put on the back burner. I think with the cooler weather arriving however, I’ll be working on this blog much more. I like to change the blog theme up with decorations and themes set for whatever season or holiday we’re near. The scary part is before we know it the holidays will be here. September’s here, next month October arrives with Halloween, and ¡POW! Thanksgiving starting off the holiday season. Anyway, I’ll be coming up with some holiday, and seasonal blog decorating tips. I’ll be posting some freebies as usual. 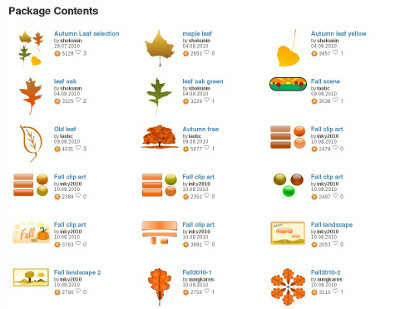 For now check out this free Autumn Clip Art set from Open Clipart. Click here to download files. This is a screen shot of some of the item you’ll find in the free Autumn Clip Art Collection. There’s a lot of really great Autumn and Fall clip art. Its that time of year again. Enjoy the free clip art, I’m going to try and add some tutorials here on doing some fun scrap booking and design ideas with some of the different clip art found there. This entry was posted in freebies, graphics, links, scrap booking, Uncategorized and tagged autumn, clip art, fall, free, freebies, september on September 1, 2014 by NewAeon.